And of course, innumerable 加油! (jai you!, which has a meaning like “go! go!”) from fellow cyclists, motorists and pedestrians along the way. 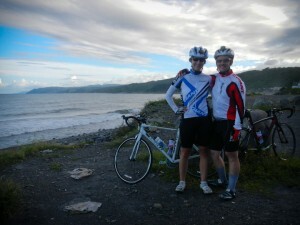 Day 1: Hsinchu to just outside Guanxi, 58 km. 1. If you add up all the distances above, you get 1014 km for me, and 1206 for Mike. The distances reported for each day are from Strava and (sometimes flaky) GPS tracking, and estimates from Strava-free days while the “official” 1184 km final count is from Mike’s odometer. 2. We chose to cross the mountains on highway 7 instead of taking the coastal route all the way around Taiwan. If you’re a purist and stick to the coastal roads for your huandao, the northern coast is ~244 km compared to our 195 over the mountains. But the coastal roads are pretty flat, and if you add up all the elevation in the mountains, I think we can call it even.